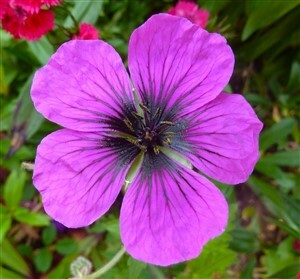 Geranium 'Dragon Heart' Alan Bremner has bred some of the best Hardy Geraniums available and this too is very good. A spreading plant with huge magenta flws with a black eye are produced for months on end right up to late autumn on a reasonable soil. Rare and sought after.